The flight team on the Kansas State University Polytechnic Campus has a brand-new leader and for the first time in the student organization’s history, it is a woman. 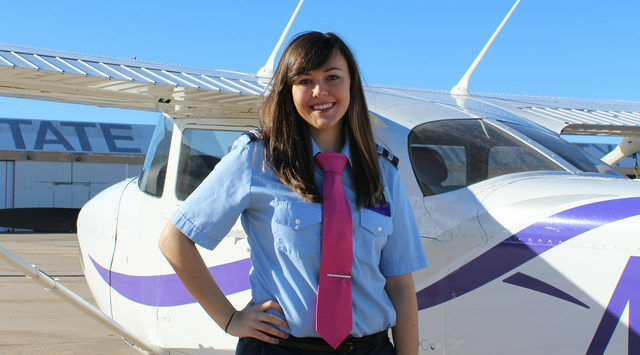 Maddie Perry, Wichita, junior in professional pilot, was selected to serve as team captain at the recent annual officer elections. She is currently the only woman on the Kansas State Polytechnic Flight Team, which is comprised of 25 members ranging from freshmen to seniors. Perry also is the first female to earn the title of captain in the group’s more than 20-year existence. As the team’s leader, Perry will be in charge of fundraising, managing community outreach events, such as their youth aviation summer programs, and preparing members for regional and national collegiate competitions. Along with adding more women to the flight team roster, Perry would like to see students beyond the aviation program join the organization. She says other collegiate flight teams have members who are engineering and math majors because they can make strong contributions to the competition events that don’t involve flying. She also wants to elevate the team’s connection with other student clubs and organizations on campus as well as with the Salina community, in particularly with youth; increase the team’s industry sponsorship and fundraising; and create an overall welcoming and encouraging environment. To be considered for flight team captain, students must meet certain qualifications, including being an active part of the team for the past competition year, having participated in the most recent competition and having been to a minimum of one competition. During elections, which also consist of voting on secretary/treasurer, safety officer and student coach, the captain candidates give a presentation to flight team members on their involvement and accomplishments, goals for the organization and why they are best suited for the position. Members then have an opportunity to ask questions of the candidates before casting anonymous ballots. In addition to flight team, Perry manages one of the wings of a residence hall on campus as a resident assistant. Currently, she is working on her certified flight instructor rating and plans to graduate in May 2019 with a bachelor’s degree in professional pilot. Her ultimate career goal is to be an airline pilot, starting at a regional carrier and then moving to a major airline. Perry’s interest in aviation was inspired by her father, who is a private pilot. She began flying with him in the family’s Cessna 182 Skylane when she was in middle school, first for enjoyment and later learning how to take the controls.